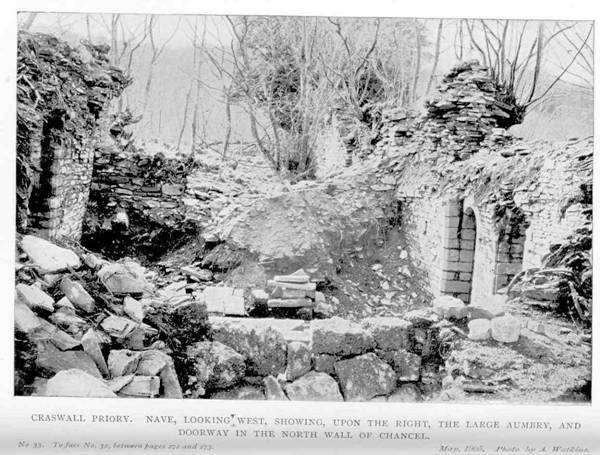 In 1904, Mr C J Lilwall, of Llydyadyway, Cusop undertook some private excavations on the site of Craswall Priory at Abbey Farm Craswall. On Tuesday 28th June 1904, about 60 members of the Woolhope Club visited the site and Mr Lilwall gave an address on his work and findings. There was also correspondence from Mr John Lloyd of London in the Hereford Times of 26th March 1904 on the Manor of Craswall. 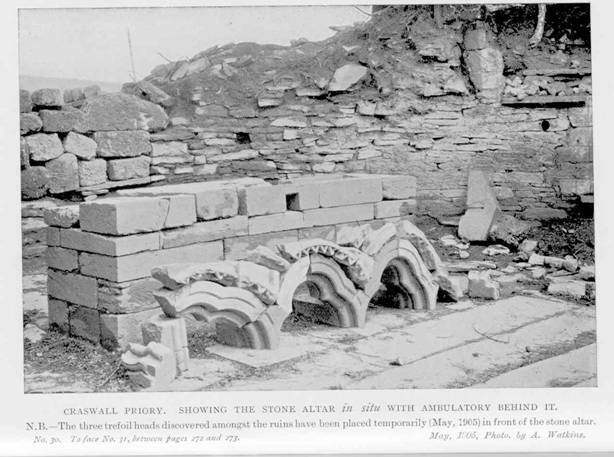 The address and correspondence are transcribed here along with photographs of the excavated remains taken in 1904 by R Clarke. 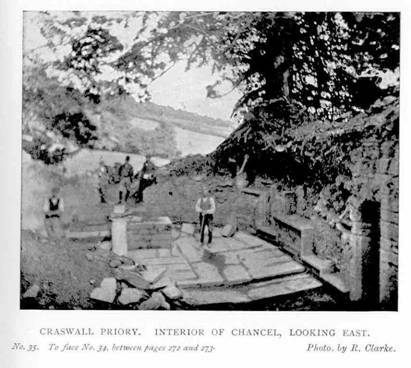 Away in the wilds, nestling in this lovely valley, far from the madding crowd, and surrounded by its park—the everlasting hills—a confused mass of ruins is all that remains of the Priory of Craswall. It was founded by Roger de Lacy in the year 1220, of a family who gave largely to the monastic establishments in this and adjoining counties. The church was dedicated to St. Mary, and three priests and ten monks were settled here. The Priory was subordinate to the Abbey of Grandmont in Normandy, and for more than two hundred years the establishment flourished. Great Lords of Herefordshire enriched it with donations of land, among whom we find such names as Theobald Vernon, Hugh de Kinardesly, Roger de Clifford, Robert-de-Eways, and others. These and other donations were confirmed by two English Kings, viz., by Henry III in the 15th year of his reign, and by Edward III In the reign of Edward IV, in the year 1462, the crash to the alien Priories came. They had long been a thorn in the side of the Bishops, extra Diocesan and extra Parochial, they cared neither for the Priest of the Parish nor for the Bishop of the Diocese. These alien Priories were of little real good to the country of their adoption. The foreign Abbey to which they were subordinate deducted from the rents of their lands a very small amount indeed for their own support, starvation wages almost, and the rest of the revenues of their estates were swept out of the country year by year. No wonder that the Government of those days looked with a jealous eye on such proceedings, and several of our monarchs seized their property for the public use. During the wars of England and France Richard II sequestrated their property for this purpose, Henry IV showed them some favour, allowed them to pay their dues to the foreign house to which they belonged in time of peace, but reserved to himself in time of war the sum they paid to their superior. So matters drifted on until the reign of Edward IV, when the alien Priories were confiscated to the Crown. Edward granted the revenues of Craswall in 1462 to God's House College, Cambridge (now Christ's College), but, strange to say, it does not appear that the grant was ever confirmed. The Priory having thus become vacant, gradually became a ruin, and one may suppose that for many years it became a quarry for the neighbourhood. Farm houses were built with its stones, and the parish roads mended with the same. No loving hand seems to have been spread over its decay, and consequently we find so little remaining, while giant yew trees guard what is left. The fish pond a little way down the valley, fed by one of the tributaries of the Monnow, no doubt supplied the brethren with fish. Stones brought to light lead us to suppose that the church was of the fourteenth century. It was long and narrow; it was not built for the outside public, but for the Brethren only. The walls of the church are in some places three feet thick, and no doubt in the Norman style. Some excavations have been made within the last few days, which have proved to be of the greatest interest. 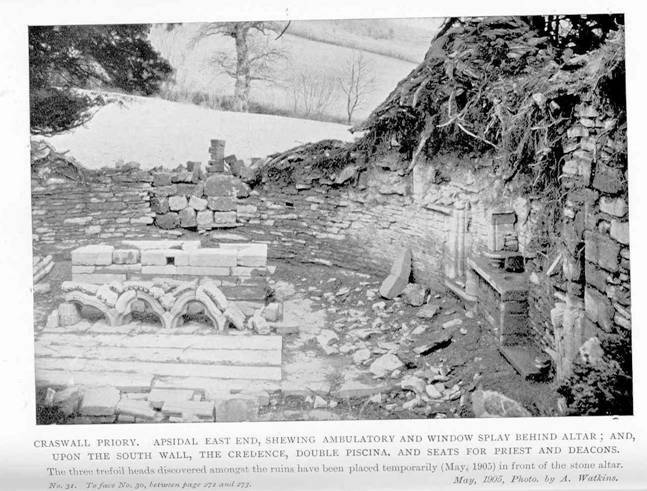 The original pavement of the Priory Church has been reached and the steps leading to the high altar have been exposed. In the course of digging, handsome bosses and fragments of the ribbing of the vaulted roof have been found. Blocks of travertine have been discovered. Some plaster with bright colouring has been dug up, and portions of columns have been laid bare. The church measures 35 feet wide, and is 104 feet in length. 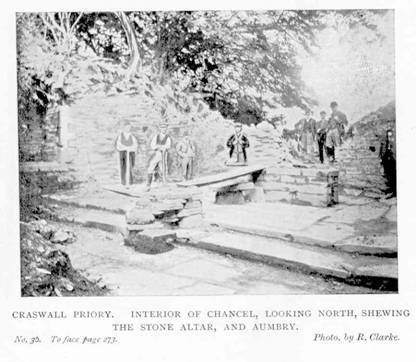 Mr. Lilwall gave a very interesting account of the great progress made under his superintendence in the Excavations at Craswall Priory since the visit of the Club on 28th June. 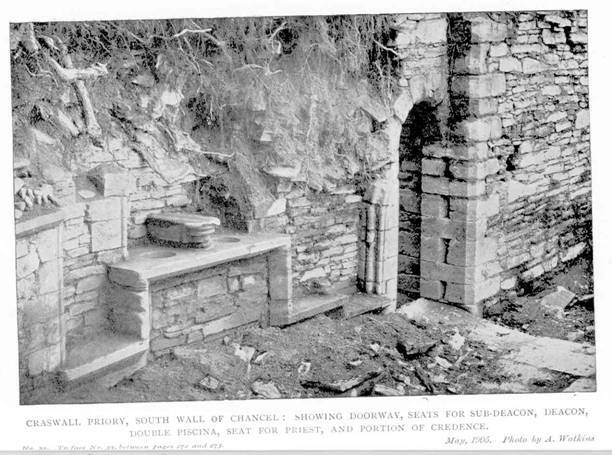 Photographs taken by Mr. Robert Clarke were on view illustrating the apsidal east end, sedilia, piscinae, a large aumbry, a large boss for nine ribs, of Early English style, Norman doorways, and deeply-splayed windows. Fragments of stained glass, decorated plaster, etc., were exhibited. A highly interesting find is a leaden box, originally enclosed in a wooden box, containing the bones of the left forearm and hand, probably the relic of some canonised person, to meet the prevailing conditions of the Earlier period before consecration of the building. Mr. Lilwall was congratulated upon the success of his labours and thanked. Craswall Manor is a Manor within the Manor of Ewyas Lacy, of which Lord Abergavenny and Mr H R Trafford are joint lords. I am indebted to Mr H Cecil Moore and through him to Mr. John Lloyd, of 15 Chepstow Place, London, for an interesting terrier dated 1578 for 1,000 years, and others dated from 1747 to 1781 on lives. Mr.Trafford, writing to Mr.Moore, October 26th, 1903, says that “Some of the leases on lives have fallen in, many however continue to pay chief rents and heriots." The lease for 1,000 years is from Richard Lingen and others of land in Craswall dated 7th December, 20th Queen Elizabeth (1578), to William Apreece Griffith, Yeom. " Heriot. The best beast on the death of any tenant. Rent £1 a year. Custom, one couple of capons at Christmas yearly. To do suit of Court of the Manor of Crasswall. Twenty shillings in the name of Relief after any alienation of premises or of any part thereof." The last lease on this document seems to have been granted by the Lords of the Manor on the 19th of July, 1781. There is also a copy of an Inventory of all books, goods, ornaments, and utensils, etc., dated September 26th, 1772, belonging respectively to the Churches of Clodock, Longtown, and Llanveino, certified under the hands of Thomas Bowen, Minister, and H. Pine, John Jones, Churchwardens. Dugdale's Monasticon, Vol. VII., p. 1035, speaks of the Alien Priory of Cresswall, or Careswall:—" Tanner calls this Priory Cresswell, Carswell, Careswell, or Kessewell. He says : 'On the borders of Breconshire, among the mountains in Ewysland was a Monastery for a Prior and ten Religious of the Order of Grandmount in Normandy, settled here about the latter end of the reign of King John, or the beginning of King Henry III., probably by Walter de Lacy. It was dedicated to the Blessed Virgin Mary. Seized among the alien Priories, and being of the yearly value of forty shillings, it was granted by Edward IV. to God's House College, now Christ's College, in Cambridge. Dugdale has preserved three charters granted to the Priory." St. Norbert, or Norbertius, Arch, of Madgebourg, was founder of the Premonstratensian Order. The name was taken from the Valley of Premontre, in the Forest of Coucy. White habit: The Premonstratensian were called in early days White Canons, and had in England 35 houses, according to Tanner. They adopted the rule of St. Austin, white habit. Their manner of living was very austere, but their order is no other than a reformation of Regular Canons, Rules of Augustine. St. Norbert died June 6th, at Madgebourg, eighth year of his episcopal dignity, 53 years of age, and in the year 1134. He was canonized by Gregory 13th in 1582. Pope Urban VIII. in 1643 appointed his festival to be kept June 10th. The saint is usually represented holding a ciborium in his hand. IN THE COUNTY OF HEREFORD. The following paper, the date of which apparently is 1695, gives some interesting particulars of this manor. There seems to have been a dispute between Mr. Smyth and the Lord of Abergavenny as to the boundaries of their respective manors near the river Monnow. Mr. Smyth was the owner of Stoke House, near Tenbury, and a man of large property there. " The College of God" at Cambridge would probably be Emanuel, or " God with us," though I have never previously seen it so called. Other papers extant as to Craswall Manor I sent some time ago to Mr. Moore, secretary of the Woolhope Club, and I trust some notes as to this interesting corner of your county from his hand will appear in their Transactions.
" Gilbert Bird Lessee to Thomas Smyth gen. plte. .pro Queren against George Ld. Abergavenny and Wm. Perrott and David Rees alias Prychard, defts.-In Ejectment. The plte. declares that whereas Thomas Smyth gen. the 1st April Anno 6 of our Sovereigne Lord King William and of our Late queen Mary att Clodock in this County did demise unto the plte. Two messuages 2 Cottages 2 Gardens 50ty acres of Lands 40ty acres of Meadow 40ty acres of pasture and 30ty acres of ffurs and heaths with the appurtenances in the Townshippe of Craswell in the parish of Clodock in the County of Hereford for the Terme of five yeares That by vertue of the said demise the plte. Entred and was thereof possessed untill that the defts. afterwards the 2d of Aprill afforesaid with force and armes into the premisses Entred and did Eject the plte. which he layes to his damage of £20. The defts. plead not Guilty. The Tenements in question are the Cottadge in possession of the deft. William Perrott and all the Lands in his possession. And the Cottadge in possession of David Rees alias Prychard and all the land in his possession parte whereof was lately in the Tenure of John Rees alias Prychard and the other parte thereof was Lately in the Tenure of Mary Prosser And the said Cottages are Erected upon And the Lands therewith used and in the defts. possession are Incroached out of parte of the wast Lands of the said pits. Lessor within his Manor of Craswell. That Craswell was a manor formerly belonging to the Priory of Craswell which was a Cell belonging to the Abby of Grandimount in France. That King Henry the Vlth seised into his hands All the prioreys Monastereys Manners and Lands belonging to fforreigne Abbeyes And by his Graunt made by Authority of Parliament in the 20th yeare of his reigne Graunted inter alia the priory of Craswell to the Colledge of Gods house in Cambridge. The Colledge the ffourth day of May Anno tercio Eliz. Sold it to Thomas Havard by the name of the mannor of Craswell. Thomas Havard Settled it to ffrances Blunt Blunt sold it to Humphrey Hare who had yssue Gilbert Hare and Anne Hare Gilbert Hare Entred and had yssue who dyed without yssue whereupon the Inheritance descended to Anne Hare. Anne Hare married to John Smyth who had yssue Thomas Smyth the Lessor of the plte. That this is a mannor will Appeare by the Deed from the Colledge to Havard and by the Court Rolls of the Court Leets and Courts Barrens there kept in the time of King Henry 7th by the Stewards of the Colledge and in every Kings reigne ever since to the present time. The Tenements in question are parte of the wast within the said Lordshippe of Craswall that Lyes on the southside of the river Monow. And are Cottages and Lands erected and incroached upon the same wast. This Comon or wast mears on the East End to the wast Lands of the Lord of Abergavenny in the Lordshippe of Ewyaslacy called old fforest. And on the west End of the Borders of Talgarth in the County of Brecon. And on the North side it Adjoynes to the Inclosed Lands and Antient Tenements of the Tenants of Craswall along the side of the River Monow. And on the South side and South west side to Olchen which is parte of the Lordshippe of Sir John Williams called Ewyaslacy and thence to the Borders of Talgarth afforesaid. The meares Between the Lord of Abergavenneyes wast Lands in the Lordshippe of Ewyaslacy. And the Lord of the Manner of Craswalls wast Lands in question are from the river Monow To the meares Called Cerrig Lloyd on and thence to a meare stone Called Carrege Wenn And thence to a place on the Toppe of the Hill there Called Crippy Garth. That all those meares are in sight from one another being upon the side of an Hill and is about halfe a quarter of a mile from the top to the bottom att the river of Monow. The wasts in both these Lordshippes were for many yeares Last Incroached by Cottagers And both Lords were deprived of a Benefitt from by the Tenants breakeing it open. Most of the Cottagers within the Lordshippe of Craswall except those in question were Erected by Ancient tennants or widdow or children of Tennants to the Lords of Craswall for the time being and suffered soe to doe out of Charity. The Lord of the Mannor of Craswall to make out his title will produce a Copy of the patent from King Henry the Sixth to the Colledge. And the deed from the Colledge to Havard and the possession of his Ancestors And diverse Antient and late presentments wherein the Meares are presented And that the Cottages and Land in question are within the meares and boundaryes of the Lordshippe of Craswall. And that the Lord of the Mannor of Craswall and his Tennants had Alwaies the profitts of the wast in Question by digging the Quaryes burneing of Lime Cutting of Turfe and Graseing the same And that a ffee ffarme rent hath been time out of minde payd to him for parte thereof And that the Cottagers have payed amerciaments for their Cottages And that all or most part of them are Tenants to the Lord of Craswall for the same And pay him an yearely rent for their severall Cottages and Incroachments and that all of them have done suit at his Courts for the same Mannor And that the defts. 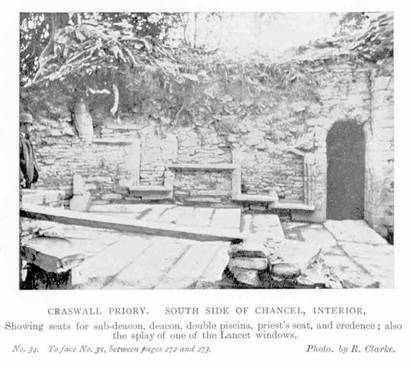 Perrott and Prychard have with the rest of their fellow Jurors presented the Cottages in question Inter alia to be the Lordshippe of Craswall. The release from the Colledge to Havard is an Ancient Deed as are alsoe severall of the Court Rolls and presentments.-Pray that they may be read. To prove the Coppy of the Graunt from King Henry the 6th to the Colledge.-David Price. To prove the meares between the Lordshippe of Craswall and the Lordshippe of Ewyaslacy for 46 years agoe and that the witnesse his father Walter Davies was Bayliffe of Craswall for 20ti yeares together and died about 20ti yeares ago That about 30ty yeares agoe the Lordshippe was surveyed and presentment made of the meares thereof And that the meares between Craswall Lordshippe and Ewyaslacy did Extend from Monow to Kerrigg Lloyd on and thence to the mear stone called Carregg Wenn and thence to Cryppy Gath and that the Cottages in question are upon that part of the wast that Lyes in the Mannor of Craswall that he lived there with his father for about 22 yeares together and removed thence about 25 yeares agoe and that when he Lived there the Tennants of Craswall had the profitts of the wast in question without Interupcion and digged quarreys and did rayse stones and Cutte Turfe upon the same And that then there were few Cottages And those for the most parte were raysed by Tenants and widdows and Children of Antiente Tenants of the former Lords of Craswall and suffered so to doe out of Charity call.-Thomas Davies." NOTE.-The Order of Grandmont was instituted at Grandmont in Limosin in France about the year 1076 by Stephen, a gentleman of Auvergne. The monks of it lived under the rule of St. Benedict, with some little variation. They were brought into England in the reign of King Henry the first, and seated at Abberbury in Shropshire. Besides which, it doth not appear that there were more than two other houses of this order in England, viz., Cressewell in Herefordshire, and Grosmont's or Eskedale in Yorkshire.-Burn's Eccl. Law, Vol. 2, p. 453.